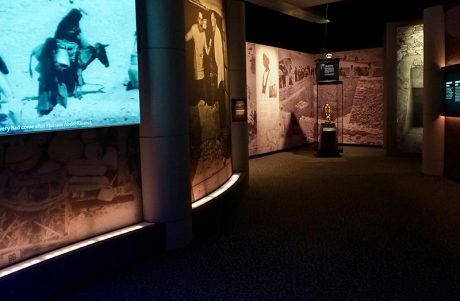 King Tut: Treasures of the Golden Pharaoh, a new six-year, 10-city touring exhibition coinciding with the upcoming 100-year anniversary of the discovery of his tomb in 1922, opened its doors to the public for the first time at the California Science Center in Los Angeles on March 24. It will remain there through Jan. 6, 2019, before moving on to other locations around the world. Some of the funds raised from the tour will go toward the new Grand Egyptian Museum, the first phase of which is due to open this month in Giza, Egypt. 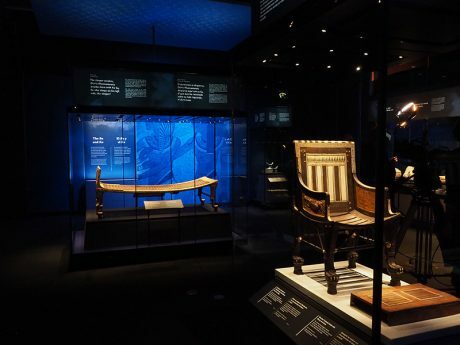 Exhibition organizers note that, upon completion of this tour, many of the artifacts on display will become part of the permanent collection of the museum near the pyramids in Giza, which is expected to become the largest archeological museum in the world. LD Brad Malkus utilized different fixtures to backlight graphics. 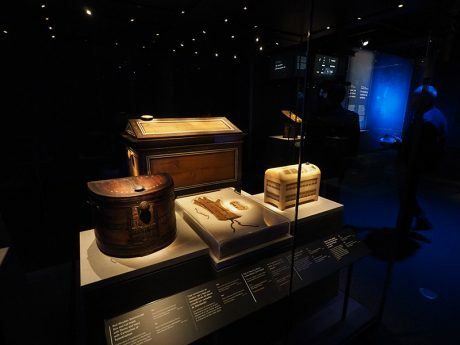 Along with the chance to view many objects not likely to ever travel outside Egypt again, the latest King Tut exhibition is drawing crowds with the largest assembly of artifacts and gold from Tutankhamun’s tomb in a public international display. 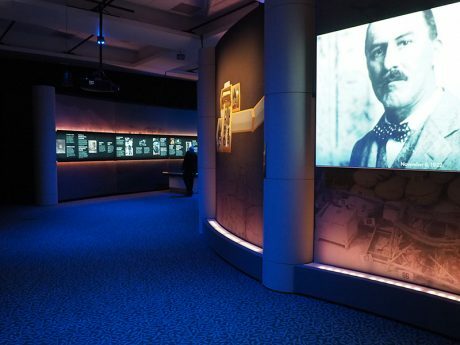 Previous exhibitions, including the Treasures of Tutankhamun that gave birth to the “blockbuster” touring museum exhibition concept when in launched in 1972, were limited to 50 artifacts. 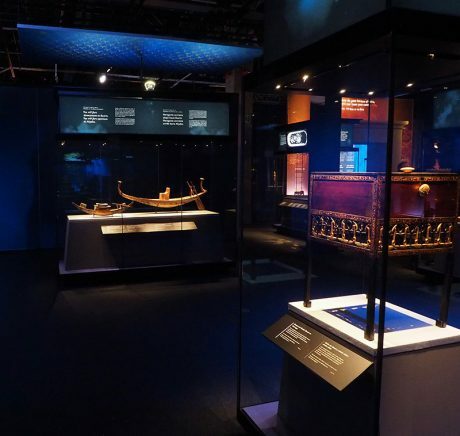 This one includes 150 artifacts, according to the organizers, who include the Egyptian Ministry of Antiquities, Exhibitions International, IMG and the California Science Center. The show is produced by Exhibitions International, a subsidiary of International Management Group (IMG).The exhibit designer is Tom Fricker, who LD Brad Malkus, a principal with Lightswitch credits as “a genius.” Malkus, based in Orlando, is one of five principals with Lightswitch, and he has worked with this creative team on many projects over the years, including one previous King Tut tour. (There have been several, starting with Tutankhamun Treasures, from 1961-1967. The most recent major exhibition, Tutankhamun and the Golden Age of the Pharaohs, ran from 2004 to 2011). Over 350 feet of Generico truss will travel on the 6-year, 10-city tour. Malkus notes that the current Treasures of the Golden Pharaoh project was fairly well evolved by the writer, Sharon Simpson, curator, and graphics artists before he got directly involved, although he was awarded the design several months in advance. There were challenges on different levels to the lighting design; space for dimmers and power, ease of dismantle and install, and as with any project, budget. 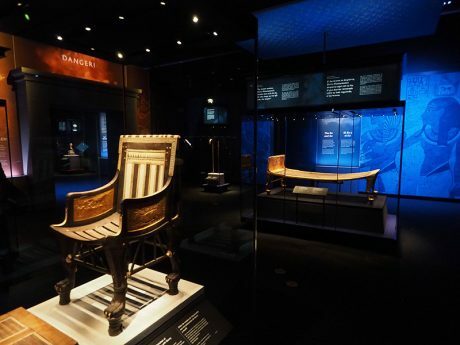 “One of the biggest challenges of touring an exhibit like this is starting from scratch each time we moved to a new hall,” Malkus says. As a solution, he and Fricker chose to place fixtures inside the custom-built display cases. Fricker also opted to purchase truss to create places on which to hang lights and supports for the walls of the exhibit. “Toppers” were designed for the display cases. As many as 40 lights illuminate the objects, depending on size and contents. Generally, the lighting from the truss is dedicated to graphics, scenic and environment. “One of the directions I wanted to go with this design, was towards an all LED system, which is exactly what we did,” Malkus continues. There is no incandescent lighting or dimming anywhere in the exhibit. The lighting design adheres to strict limits on foot-candles. Lighting cues were programmed on ETC’s Mosaic Designer software and stored on the three Mosaic controllers on site. One carries a single universe, while the other two each have two universes. Using Mosaic provides the advantage of updating and storing cues remotely from Malkus’ Orlando office. A Crestron Show Control system provided by Design Electronic triggers the lighting cues, as well as sound and video. Another challenge Malkus encountered on the Tut exhibit, and his museum designs in general, is finding a balance between lighting the objects to look dramatic and theatrical, while illuminating them enough for the guests to properly view them. In a museum environment, preservation is the number-one priority, and all decisions about lighting are also made with conservation in mind. Scenic elements were built at Cinnabar California Inc. in Los Angeles. The display cases, built by ClickNetherfield, have lights built into the top so they are focusable onto the artifacts. Called “case toppers,” these separate components sit atop each display case. They contain a complicated array of multi functional items including fixtures backlighting graphics on all four sides, and in some cases video screens on two sides. Illuminated audio tour numbers can also be viewed via edge lit acrylic pieces. These numbers correlate with the sections describing the artifact on the self-guided tour maps available with headsets. The “case toppers” were also designed to help move the sizable crowds smoothly through the exhibit. 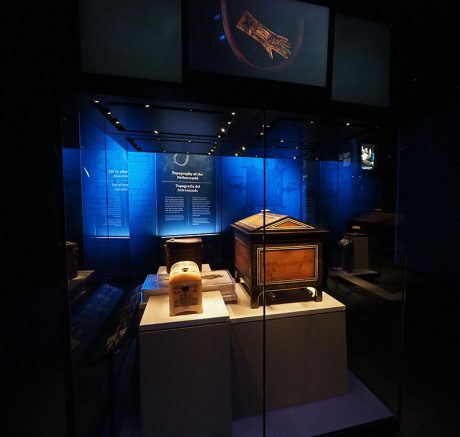 As the patrons wait to get closer to actually look inside the case, they are able to read from afar what the case contains or get video information about the artifact. Hanging from the truss structure above the most important artifacts are flat fabric panels the team refers to as “clouds.” These draw attention so the displayed pieces stand out. The light softly illuminating the “clouds” is positioned in the case topper as well, bouncing an ambient glow into the gallery rather than any harsh glare. Blue “clouds” of fabric were suspended over artifacts. That goes with the territory for these kinds of shows. Malkus notes the project “continued to morph” well after initial design layout. For King Tut: Treasures of the Golden Pharaoh, Generico Entertainment Products supplied more than 350 pieces of black powder coated 12-inch Generico truss, dollies, corners, and bases including a 30-foot (outer diameter) truss circle. In addition, Generico supplied well over 500 pieces of its own lines of cabling products, including almost 600 pieces of 19-pin Socapex, Edison cable, DMX cable and Cam-Lok assemblies. Philip “Alf” Zammit, Malkus’ head electrician, has worked with him on many such projects over the years. Zammit plays a large part in the build and runs the crew comprised of two Exhibition International staff as well as two to eight locals depending on what phase of installation they are at. For more details on Generico, see “Company Spotlight,” PLSN, May 2018, page 46.